I’m pretty adept at tracking things down on line, yet finding useful information about UST air compressors was problematical. Who makes UST air compressors? The answer is that it likely was the lowest cost compressor and generator manufacturer in China. Got issues with your UST air compressors? Here is your page. UST air compressors might have been distributed in North America by International Merchandising Service, Inc. Virtually no information about this company is available where I can find it. The website for UST is : http://www.usttools.com/ but when you visit, all you see is that this is the home page, and the logo for UST and a logo for tools. One source says UST compressors is a line of UST ULTIMATE SOLUTION TOOLS, by International Merchandising Service, Inc. They offer Air compressors; Portable electric power generators, Hand tools, namely, hammers, screwdrivers, wrenches. No further information can be found about them than their site which is that of UST. The phone number goes to an automatic answering service, but the memory is full, and no further messages can be left. I know that at one time UST air compressors were sold through Northern Tool. They also were available from Pep Boys. Amazon sold them too and it appears as though many people acquired their UST air compressors from overstock.com. Northern Tool now says the UST compressors line is discontinued. Pep Boys links for this brand takes you to a different brand. While some of the UST air compressors models are available at various outlets on line, there does not appear to be new product entering the distribution stream. Where do you go when you have a problem with your UST compressor? If you have an UST Compressor and have a problem, here is your forum. If you have a question about the use of your UST Compressor, consider looking at the troubleshooting section on this site. Many compressor problems you may be experiencing are shared by lots of brands, and solutions are already found. No answer there? Add your question using the form. 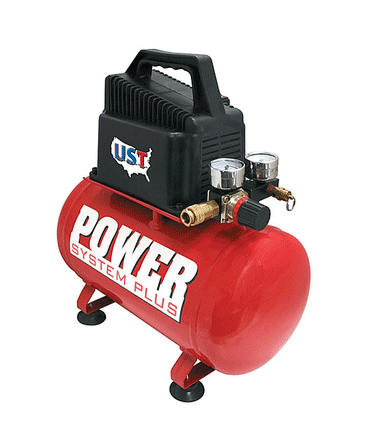 If you own and use a UST Air compressor, and can add any advice to any comment we’d all appreciate it. We have UST Power System Model 1110c and can’t find parts. UST 110C max pressure cut doesn’t work and motor eventually stalls at 65-70 psi. How do I get parts for my UST air compressor model 1125c?